A lunch box that’s meant to be crushed? That may sound like a recipe for smashed sandwiches, but it’s not. 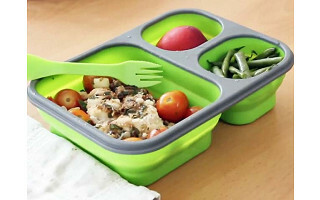 The collapsible meal containers from Smart Planet are designed to flatten to half their original size. It’s a space-saving feature, so you can easily slip the empty containers into a bag or cabinet when you’re done eating. Mike Katz founded Smart Planet in 1998 to create eco-friendly household products, and the low-profile containers are his latest creation. They’re made from food-safe silicone and plastic, and each comes with a spork utensil that stores in the lid. The silicone is flexible, so once you’ve finished eating, simply place the lid on top, push to collapse the compartments, and then snap the lid in place to keep the flattened container secure. Many of us would like to eat more home-prepped meals rather getting takeout. It’s easier to plan a healthy meal when you’re making it at home, plus it saves money. Smart Planet’s ingenious containers make packing lunch even more palatable: They’re roomy enough for a healthy meal and conveniently slim when you’re done eating. Hi y’all, I will be your curator for your journey through lunch solutions. I hate when a product lets me down. Hate it, the unrealized potential. When we conceived this line our goal was to answer every conceivable question through the design of the product. Is it BPA free, dishwasher & microwave safe, crack/break resistant, collapsible, stackable, safe to handle right out of the microwave, leak resistant, fashion forward, all inclusive, etc… All I can say is check, check, check! This is the one solution that doesn’t leave you wanting more. A quick joke to set the stage for any questions you might have. Knock Knock who's there? Lettuce... Lettuce who? Lettuce in and we'll tell you anything you want to know! Enjoy. The lid of the large box looks like it has a circular (removable?) insert. What is that? @ Ruth - This is what we call a condiment pod. Its meant to hold any dressing or dipping sauce. The lid is made from silicone and seals air tight. I love my smart lunch containers. However, one of the clips holding the pod with the sporf broke off. Now my utensil falls into my food, or I have to carry it with the utensil held with a rubberband on the outside of the container. What to do? @ Gail: Glad to hear you're enjoying lunch with the container. So sorry the clip misbehaved. Our Customer Support Team will be in touch with you directly to resolve the issue. What about the longevity of the silicone? How long before all that smashing closed and re-opening causes integrity issues such as cracks? 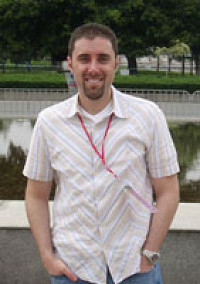 @Sarah: Jeff, our Grommet partner, has this to share: "Good question. 100% silicone found in our units have an active lifecycle of 120,000+ processes prior to any forms of degradation to the collapsible portion of the unit." I purchased the small container and I can't get the clips to close properly. The only thing that holds it closed is the rubber band they included with it. Am I doing something wrong? The clips on the top just don't grab onto the container. 1) Are the dimensions given for the item when it is flattened, or as expanded? 2) when expanded and holding food, is the lid tight enough that liquid cannot spill out? i.e., is it spill proof? 1) Small: Dimensions: 1.2” x 7.2” x 6” when flattened. Dimensions: 2.5” x 7.2” x 6” when expanded. Large: Dimensions: 1.25” x 7.25” x 10.25” when flattened. Dimensions: 2.5” x 7.25” x 10.25” when expanded. 2) We cannot claim the lunch box as leak proof as the seal is not of a vacuum nature. Our test have concluded that room temperature or below liquids of any nature are almost always leak proof in normal conditions i.e. non crushing of the unit under high pressure. Once liquid of any kind is set to a higher temperature where steam is created, then pressure can build, creating a higher possibility of leaking under extreme conditions. All leaking occurred during our test under extreme conditions of high temperature mixed with either shaking, crushing or extended inversion. For typical consumer use, we did not find the unit had any risk of leaking. A lunch box that’s meant to be crushed? That may sound like a recipe for smashed sandwiches, but it’s not. The collapsible meal containers from Smart Planet are designed to flatten to half their original size. It’s a space-saving feature, so you can easily slip the empty containers into a bag or cabinet when you’re done eating. Mike Katz founded Smart Planet in 1998 to create eco-friendly household products, and the low-profile containers are his latest creation. 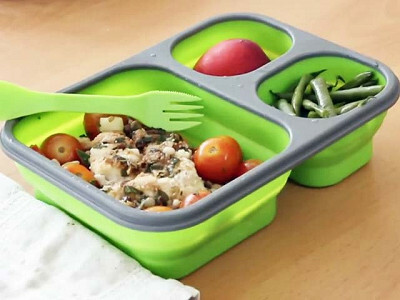 They’re made from food-safe silicone and plastic, and each comes with a spork utensil that stores in the lid. The silicone is flexible, so once you’ve finished eating, simply place the lid on top, push to collapse the compartments, and then snap the lid in place to keep the flattened container secure.